Windows 8.1 and previous Windows versions didn’t support recording computer’s screen out of the box. We had to use third-party applications in order to record games. With Windows 10, Microsoft introduced a screen recording utility. The utility or feature is meant for recording games out of the box. The Game bar is designed to help you control the Game DVR feature for recording and broadcasting games without the help of third-party software. While running an app or game, you can simply press Windows logo + G hotkey to open the Game bar. If you try to open the Game bar for a specific program for the first time, you will see “Do you want to open the Game bar?” with “Yes, this is a game” option. Click “Yes, this is a game” option to see the Game bar. As you can see, the Game bar houses Xbox, take screenshot, record that, start recording, broadcast and Game bar settings icons. Once you click anywhere else on the screen, the Game bar disappears. The Game DVR also supports background recording. You can also broadcast your games with the broadcast feature. The Game bar certainly is one of the best features introduced with Windows 10. However, there is a catch. Although it can capture games and other apps, it cannot be used to record your desktop, File Explorer, and some other areas of the operating system. Because of this, you cannot use it like other third-party screen recording utilities. Besides that, there are plenty of free and commercial third-party applications with extra capabilities. PC gamers who regularly record games, prefer using advanced third-party recorders over the built-in feature. 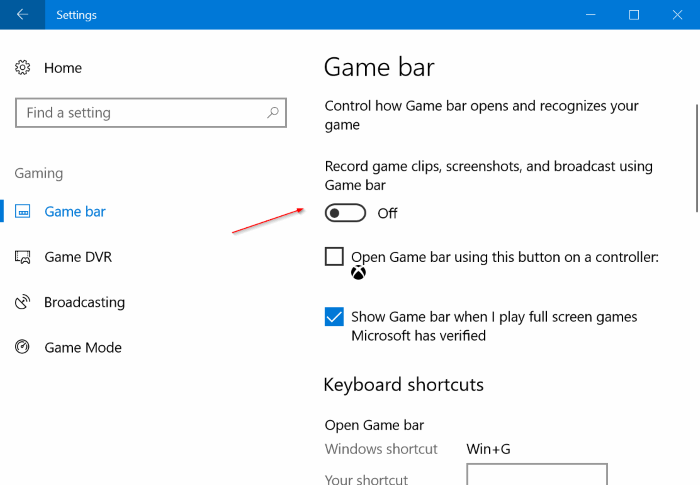 If you don’t record games or apps, you might want to disable the Game bar to avoid accidentally opening it with Windows logo + G keyboard shortcut. Luckily, it’s possible to turn off the Game bar. Here is how to do that. Step 1: Open Settings. Navigate to Gaming > Game bar. Step 2: Turn off Record game clips, screenshots, and broadcast using Game bar option to disable the Game bar.